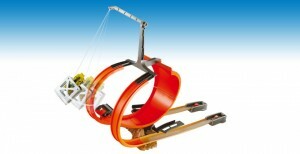 Just When You Thought You'd Seen it All » Blog Archive » Real Life Hot Wheels Track! Real Life Hot Wheels Track! All my prayers have been answered! 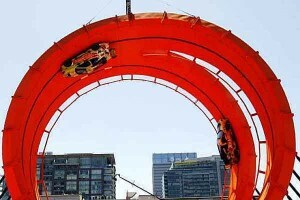 Rally car driver Tanner Foust and stuntman Greg Tracy set a world record by driving through a real life Hot Wheels Track. This track, inspired by Hot Wheels newest set, the Double Dare Snare , is more than six stories tall, took 125 tons of plywood and steel to build and over 500 gallons of “Hot Wheels Orange” paint! The drivers had to maintain a speed between 48 and 52 miles per hour while in the loop in order to stay on the track and not have any part of their car hit any of the curves. We have a video of the phenomenal stunt after the break. Just When You Thought You'd Seen it All All rights reserved.